The 12th month in Chinese Calendar is called La month. The 7th day and 8th day are called LaQi and LaBa respectively. There is a saying that on the 7th(LaQi) and 8th(LaBa) of 12th month it can freeze your lower jaw off. There two traditional Chinese foods in LaBa (the 8th day of 12th month).Laba Garlic (Laba Suan in Chinese) and Laba Porridge (Laba Zhou in Chinese). In north of China it's a custom to make LaBa Garlic(garlic is soaked in rice vinegar). The procedure is simple. Choose pink peel of garlic. Peel off. Clean cloves. Add in a closed bottle. fill with rice vinegar (you can add some sugar if you like sweet). Cover. Two weeks later the garlic will change to green color, One or two weeks later (depends on the temperature) the garlic will become emerald green color, crispy and fresh. Not very spicy, just right. Then it's exactly Spring Festival. 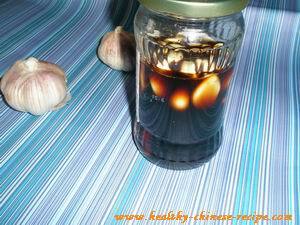 Served with Jiaozi(Dumpling) or any other meat dishes, LaBa Garlic helps to remove grease, promoting metabolism. It contains more antioxidant than that of original garlic. Even more, it tastes crispy, sweet and sour with garlic fragrance. Get Laba Garlic Recipe here. Another food in LaBa is Laba Porridge which is very popular all over China. Put all kinds of cereals and dried fruits together, then cook into porridge. Because all cereals are whole grains, plus dried fruits, Laba porridge is rich in nutrition. It's the right supplement in late winter, no oil, not as greasy as that of meat. It contains many beans and seeds which are full of energy. There are two versions about its source. One is said to be from India, Buddha. Another story is said it's the way to celebrate harvest in folk. 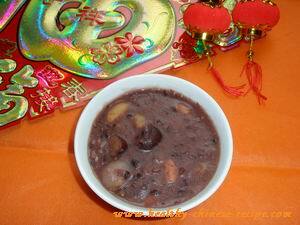 Original Laba Porridge must contain glutinous rice and small red bean. Now people add in many different food according to their own tastes. Most porridges are composed of cereals and a little dried fruits. In some areas such Jiangsu province people like to mix vegetable and tofu in Laba Porridge. Get Laba Porridge Recipe here.